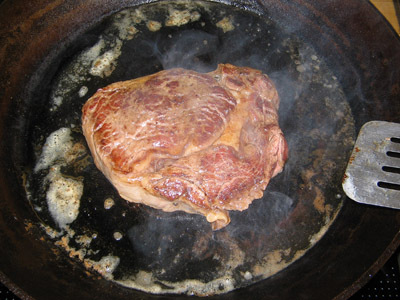 According to new study, frying meat in a pan on a gas hob may be worse than using an electric ring for raising the risk of cancer. The new research suggests that professional chefs & cooks may be particularly at risk. The International Agency for Research on Cancer (IARC) has recently classified cooking fumes produced during high temperature frying as "probably carcinogenic." Potentially harmful polycyclic aromatic hydrocarbons or PAHs for short, heterocyclic amines, & higher & mutagenic aldehydes, along with fine & ultrafine particles, 've all been found in cooking fumes, using vegetable oils, such as safflower, soya bean, & rapeseed oils, as well as lard. However, it is not clear if the energy source or the type of fat used for cooking have any impact on fume content. The research team simulated the conditions found in a typical Western European restaurant kitchen, frying 17 pieces of steak, weighing 400 g each, for 15 minutes. They used either margarine or two different brands of soya bean oil to cook the steak on gas & electric hobs. The margarine contained a blend of soya bean, rapeseed, coconut & palm oils as well as vitamins A and D, but no hydrogenated fats.They measured the amount of PAH, aldehydes, & total particulate matter produced in the breathing zone of the cook. Napthalene - a banned chemical contained in traditional mothballs - was the only PAH detected & ranged from 0.15 to 0.27 ug/m3 air in 16 of the 17 meat samples. The highest levels were produced when frying with margarine on the gas hob. Higher aldehydes were produced during the frying of all the samples, while mutagenic aldehydes were produced for most samples. Overall levels ranged from undetectable to 61.80 ug/m3 air, but the highest levels were found when frying on the gas hob, irrespective of the type of fat used. The peak number of ultrafine particles during frying on the gas hob was considerably higher than when cooking with electricity. Particle size with gas was 40 to 60 nm compared with 80 to 100 nm with electricity. Ultrafine particles 're more readily absorbed into the lung. The authors point out that the levels of PAHs and particulate matter found during this study were below accepted occupational safety thresholds. But they add that cooking fumes contain various other harmful components for which there is as yet no clear safety threshold, & gas cooking seems to increase exposure to these components. "Exposure to cooking fumes should be reduced as much as possible," they said.